wikipedia notes: In 1967, Ali and Terrell met to end the confusion about who was the legitimate heavyweight champion. 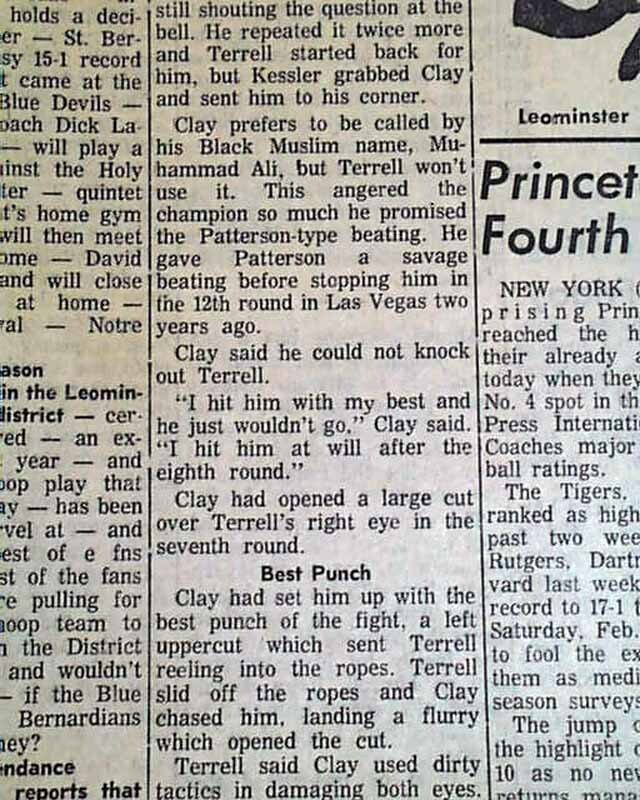 Before the bout, Terrell chose to call Ali by his birth name, Cassius Clay, rather than his adopted Muslim name. Ali took offense to this, as he had in a previous fight with Ring Legend Floyd Patterson where Patterson chose to call Ali 'Clay.' 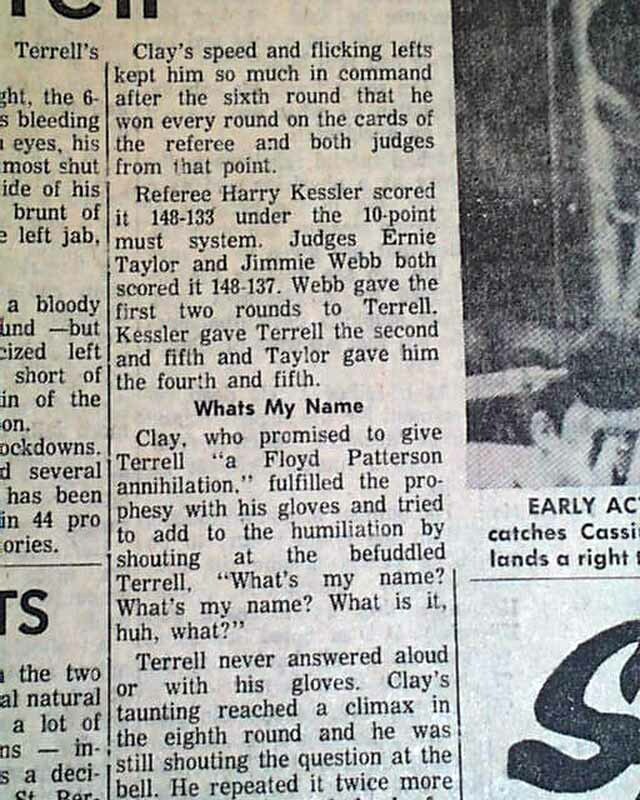 Ali said he would punish Terrell as he had punished Patterson, having beaten on Patterson for 12 rounds, having him hurt but not knocking him out so that he could continue to punish him. Ali shoved Terrell during an interview with Howard Cosell which almost led to a brawl. Ali did what he said he would, beating on Terrell the entire fight, having him hurt badly but purposely not knocking him out, wanting to beat on him more and punish him for not calling him by his chosen name. Ali screamed at Terrell "What's my name, Uncle Tom?" 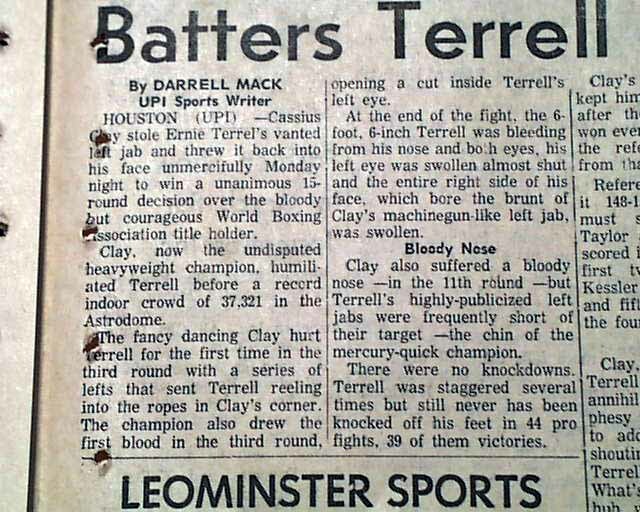 as he battered him with lightning fast punches that kept cutting Terrell's face. 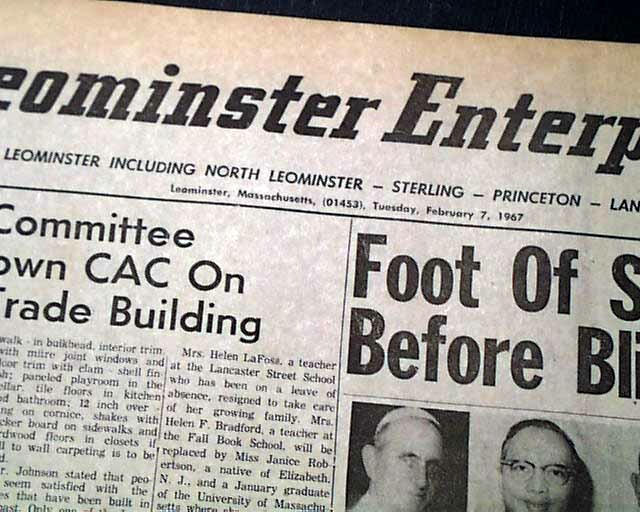 With blood streaming down his nose and mouth, and his eyes swollen shut from the earlier lightning punches, Ernie could barely see Ali's fists coming. 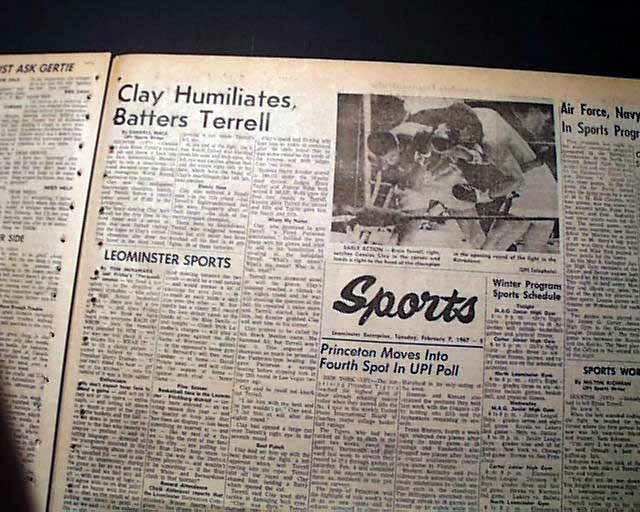 People were disgusted with the humiliation Terrell received from Ali. 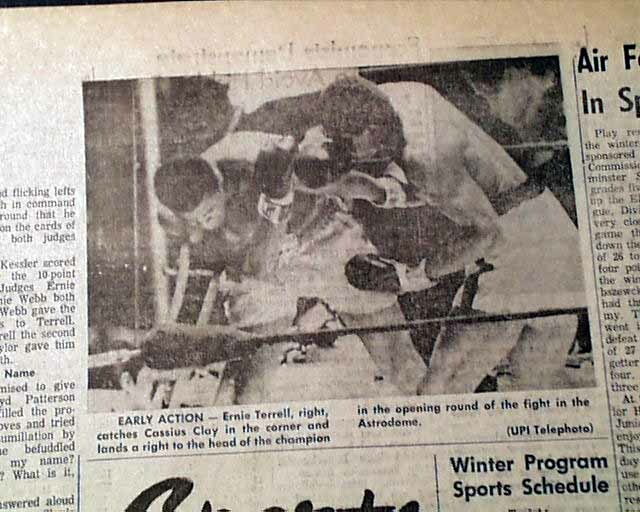 Ali won a lopsided 15 round decision, reclaiming the undisputed Championship. By the end of the fight, Terrell's face was reduced to a bloody pulp. Terrell claimed the reason for this was due to being fouled by Ali. 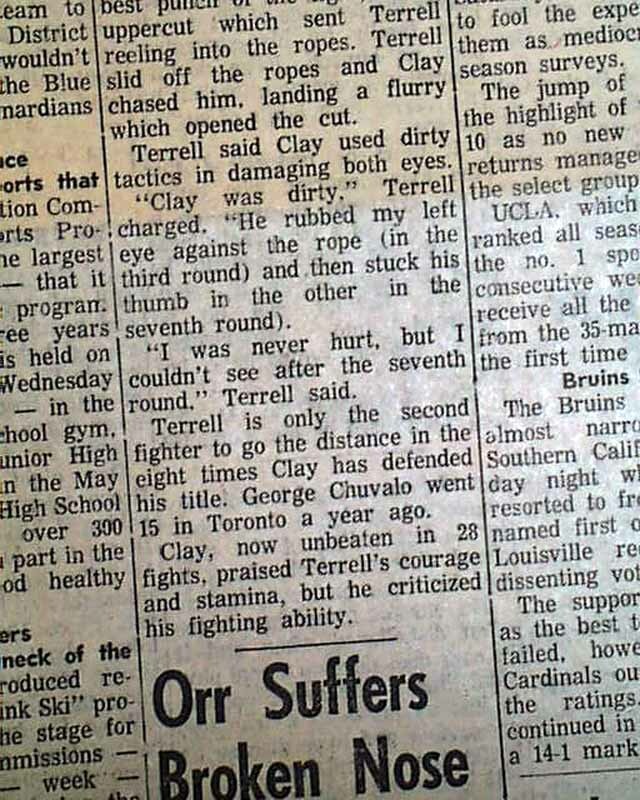 Terrell said Ali thumbed in the eye which closed his eye, which made Terrell change his style. This would inhibit the chance to win the fight and Ali went on to win a lopsided unanimous decision. The fight is recounted, though not entirely accurately, by the film Ali starring Will Smith.condition.